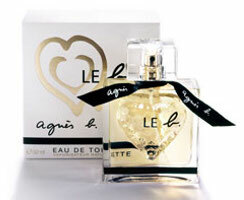 Designer Agnès b released her first fragrance, le b, in 1987. For 2007, she has asked perfumer Olivia Giacobetti to rework that fragrance taking as inspiration a holiday theme: sun, fresh cotton, laziness, white sand, white flowers, wrinkled linen. Kanabeach Femme (shown), for active and contemporary women, features notes of bergamot, tangerine, strawberry, jasmine, frangipani, vanilla, amber and sandalwood. It is available in 30, 50 and 100 ml Eau de parfum. Are the Kanabeach frags released in the states? What a fabulous bottle! Looks like they are in the UK & Canada, but not here! I'm sorry but I've never smelled any of the Agnes b scents, so I'll be no help.